The Information and Communications Technology Center (ICTC) of De La Salle University-Dasmariñas (DLSU-D) in coordination with its Environmental Resources Management Center (ERMaC) will hold its first E-waste Awareness Day on 7 March 2014. The event will feature an E-Waste seminar, environmental film showing and capped by a Mangrove planting activity in Batangas. The event is part of DLSU-D’s promotion in the proper management and disposal of electronic waste under the ICTC’s Project ICON (ICT Creates Opportunities for Nature).DLSU-D students, faculty and staff donated their old, broken and obsolete electronics to the ICON booth for proper disposal by ICTC and ERMaC. These disposed electronics are returned to the recycling plant and proceeds support the annual ICTC’s tree planting program in support of DLSP’s One Million Trees and Beyond Project. For more details, please visit www.dlsud.edu.ph/icon. Relief operations in Bacolod still on going as they focus on the areas in Northern Negros. They will be distributing relief goods to Cadiz this Saturday. Fr. Ed Penafiel, relief coordinator of Task force Tulong Calamian, has sent his message of thanks to the Lasallian Family for the relief goods we shipped for the affected families in Northern Palawan. He expressed his gratitude and mentioned that the relief packs sent will benefit thousands of families in their area. Our schools have once again consolidated the donations in kind that we received for the past days to be able to cater to the affected families in Leyte. We have partnered with the Parishes in Abuyog and Tanauan for distribution of relief goods in their respective areas. All of which will happen late this week, with volunteers from LSGH joining in the Leyte dispatch. Plans are shaping up for this project, thanks to our partners in DLSHSI! We have also partnered with the Diocese of Antique to ensure the organised conduct of the Medical mission. Specific dates will be released soon after travel to Antique has been finalised. For the meantime, we are asking for donations in the form of medicine specifically for cough and colds, fever, asthma, COPD, hypertension, diabetes, antibiotics, anti - tetanus, anti - fungal, nebulizers, vitamins, and heart medicine. You may drop off the donations in the DLSP Central House in La Salle Greenhills. Please look for Mr. Randy Casayuran. Br. Jose Mari Jimenez FSC, De La Salle Philippines President, released a letter to the Presidents of La Salle Schools encouraging our them to come up with creative ways of generating funds for the rehabilitation plans. The Lasallian Justice and Peace Commission (LJPC) will continue to assess which areas we will respond to as we commit to rebuild schools. Our fellow Lasallians in Bacolod have distributed more the 12,000 relief packs over the past days to Sagay, Cadiz and Manapla in Negros Occidental, Bantayan Island in Cebu and in Panay Island – Roxas, Iloilo to name a few. They continue to collect and pack relief goods for distribution in Northern Negros. We have already dispatched more than 6,000 family relief packs for Guiuan, Eastern Samar. Once it reaches the Port of Borongan, the Diocese will be handling its distribution to the affected families. The donations (in kind) of this batch of relief goods sent to Guiuan was collected from our La Salle schools in Luzon and through DLSZ's partnership with our friends and alumni from St. James Parish, Brgy. Ayala Alabang, AAVA and the Diocese of Parañaque. After the Guiuan dispatch, our focus is now on Coron Palawan. We were able to speak to Fr. Eddie Penafiel (Relief Coordinator in the five Parishes in Coron and Busuanga), and he says they are badly in need of relief goods for 20,000 families. We are currently mapping out a dispatch plan from Manila to Coron Palawan. Just like what we did for the batch of relief goods sent to Guiuan, we will ask the Luzon schools for the number of relief packs they can commit to share by Thursday. Realistically speaking, I think the consolidated goods from our Luzon schools can reach 5,000 relief packs until Thursday. DLSHSI is now in contact with communities where a Medical Mission can be done, an isolated area somewhere in the Antique province is being considered. Details about this plan will be clearer within this week. Schools in Luzon remain as drop off points for donations. Most of them are doing their own re-packing already and will send the repacked to DLSU for the Coron dispatch. Visayas and Mindanao schools have also initiated efforts in soliciting monetary donations. The amount that we will be able to pool from our La Salle schools and various donors will be used for the rehabilitation projects. Over the weekend, the Central House and our DLSP schools have called out for donations in cash and in kind for the Typhoon Yolanda victims. Together with the Lasallian Justice and Peace Commission (LJPC) and our contacts from the different Social Action Offices of our schools, we have identified the University of St. La Salle (USLS) in Bacolod to be our main relief centre and DLSP will be sending to USLS the donations we've gathered. The location of USLS in the Visayas region will be very strategic given that our priority areas for relief are Sagay and Cadiz in Negros Occidental, Batayan in Cebu, Iloilo and Roxas. The aforementioned areas are not that publicised in the news, but are equally in need of relief goods like that of the areas in Tacloban and Samar. Currently, we are also in touch with contacts from Guiuan Eastern Samar, the area where Typhoon Yolanda had made its first land fall. We have yet to get more precise information as to how long will relief be needed. Though we expect it to take a long time since the ones drastically affected have no homes to return to and that the evacuation centres will be their only refuge for now. As to our plan for the rehabilitation phase, we are looking at rebuilding the public schools in the affected areas. We will be more specific with details regarding this plan soon after we discuss the project. For tracking and monitoring purposes, we also wish to request the donors to email the deposit slip to bee.cruz@delasalle.ph or fax it to +63 2 721 5049. Please feel free to contact Mr. Keane Palatino at +63 917 500 5323 or Mr. Gladstone Cuarteros at +63 917 843 9468 for any questions or clarifications. 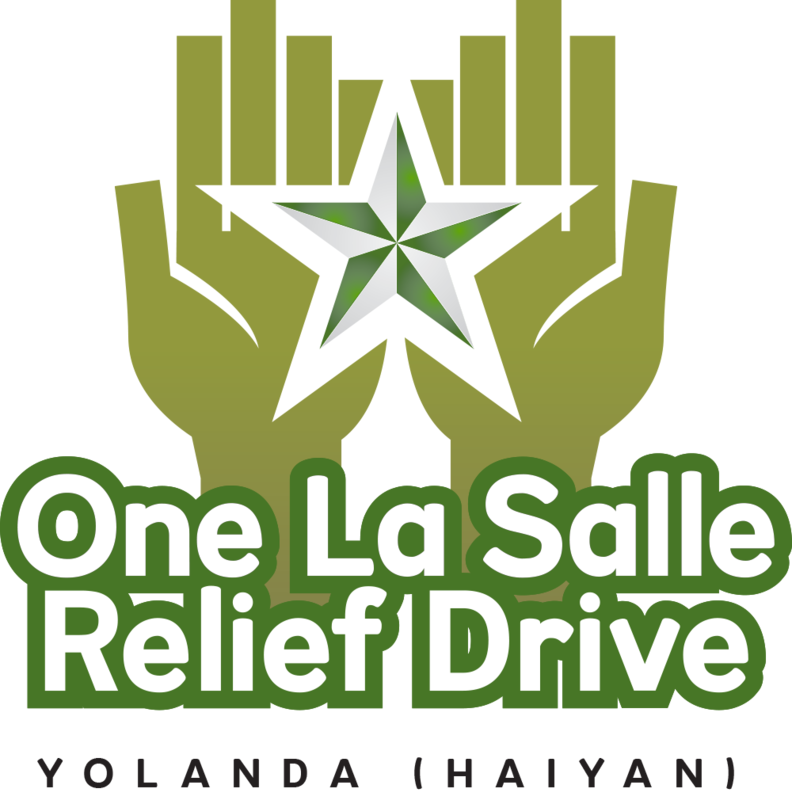 For the specific details of each La Salle schools' relief operations, click here. Update 1 : 11 November 2013, 04:25 PM - Added details for De La Salle University - Dasmariñas and University of Saint La Salle. Update 2 : 12 November 2013, 12:20 PM - Added details for De La Salle-College of Saint Benilde. Update 3 : 14 November 2013, 4:22 PM - Updated bank details of USLS and added De La Salle Health Sciences Institute information. Update 4 : 19 November 2013, 10:27 PM - Updated details of DLSL relief ops and added De La Salle Solidarietà Internazionale - ONLUS information. Update 5 : 2 December 2013, 2:11 PM - Added La Salle University relief operation details. The Philippine Lasallian Family is banding together once again for relief operations for our fellow Filipinos who were affected by Super Typhoon Yolanda. Various La Salle Schools have begun taking in donations and volunteers. We request you to email the validated deposit slip to bee.cruz@delasalle.ph for proper acknowledgment and issuance of official receipt. You may also opt to fax it to +63 2 721 5049. For more information, you may contact Keane Palatino (+63 917 500 5323) or Gladstone Cuarteros (+63 917 843 9468). DLSZ is accepting relief donations at Gate 2, 3. & 7. Preferably rice, noodles, canned goods, bottles water & mats. For cash donations for relief & post rehabilitation: Please deposit to the school's account below and send a scanned copy of the deposit slip to lesacasr@dlszobel.edu.ph and jacintojn@dlszobel.edu.ph for proper acknowledgment. Please call or text Mr. Jayjay Jacinto at +63 917 859 7602 and Ms. Evangeline De Peralta at +63 917 563 8870 for queries. Deposit it through the DLSU Cashier. Inform them to credit your donations to the DLSU Relief Fund (Acct # 600-135). Please do not forget to send one copy of the official receipt to Ms. Jan Trampe of COSCA for proper acknowledgement. Send all of your in-kind donations to COSCA. Make sure you click on the Philippine Disaster Relief Project being implemented by De La Salle University. You may use this facility for your credit and debit cards donations. For more inquiries, please contact Mr. Joseph Rosal, Coordinator for Community Engagement, COSCA at +63 2 525 4267 or local 147. La Salle Green Hills will be accepting monetary donations starting Monday, 11 November, for the victims of super typhoon "Yolanda". Kindly course your donations to the Lasallian Mission Office or the Accounting Office. For check donations, please make it payable to LA SALLE GREEN HILLS - CALAMITY FUND. For more information, you may contact Mr. Eugene Young of the LSGH Lasallian Mission Office at +63 2 721 2000 local 350. Kindly email your deposit slip to Mr. RJ Angeles at raejyn.angeles@dlsau.delasalle.ph or fax it at +63 2 330 9125. USLS is accepting donations (food, water, clothes, medicine) and cash. USLS has set up a special bank account with BPI (La Salle branch) for Yolanda typhoon victims. For inquiries, please call +63 34 434 6100 local 218, 122, or 133. De La Salle Lipa is accepting donations in cash and in kind, below are the details. Account Name: De La Salle Lipa, Inc.
DLSL’s Cashiers, Student Activity Office, and the Community Involvement Office. An acknowledgement receipt will be issued. Mission and Mass collections at the Capilla De San Juan Bautista De La Salle. The following donation in kind may be dropped off at the College Lobby. For inquiries, please call 043 756-5555 local 277 or 317 or call 981-1133 or 981-1177. The Lasallian Community Development Center (LCDC) is knocking on the hearts of the Lasallian community to extend aid to calamity victims. DLS-CSB is setting up facilities to generate donations for the survivors of the super typhoon. Donation centers are up in the lobby areas of our three campuses. For those donating in kind, used clothes and noodles are not priority items for now. Cash donations may now be made through bank transfer. To donate, please use the following account information. Account Name: Lasallian Educational Innovators Foundation (De La Salle-College of Saint Benilde), Inc.
DLS-CSB personnel may also donate through iPLEDGE which allows monetary donations through salary deduction. Counseling services are available to Lasallians who are affected by the typhoon. You may go to the Center for Counseling Services from 9am to 5pm. Students and personnel who wish to volunteer may sign up at the Center for Social Action. For inquiries, please call the Center for Social Action Volunteers at +63 2 526-7441 local 258 or 266. For check donations, please make the check/s payable to Hermano (San) Miguel Febres Cordero Medical Education Foundation, Inc.
Kindly fax the deposit slip and reply form to +63 2 988 3100 local 8029. You may also call DLSHSI for pick up of cash donations within Metro Manila or Cavite. With the devastation of super typhoon Haiyan, the Lasallian community is coming together to offer assistance to our fellow Brothers, associates, friends and families. The Brothers report considerable need for both immediate support, in the form of food and water supplies, as well as long-term support for reconstruction in damaged classrooms. Kindly send electronic copy of your deposit slip to isco137@gmail.com for proper acknowledgment and issuance of official receipt. You may also opt to fax it to +63 521 1010. For more information, you may contact Dr. Rezyl R. Mallorca (+63 926 339 1818) or Anilou Dilao (+63 927 715 7062 or +63 920 746 6686).